WHITEHOUSE (WTVG) - We all know how tough the cold has been on people and pets this week. But what about wild animals? A local wildlife rehabilitation center has been a busy place. This time of year is usually a bit slower at Nature's Nursery, but that is not the case right now. The center took in five animals Friday. This time of year the average number is about an animal per day. Steve Kiessling is the Executive Director, "We seem to be getting busier and busier each year. We took in 50 animals last month, that's up a few from the same time last year." This week's weather has made for a lot of extra work at Nature's Nursery. Laura Zitzelberger is the Operations Director, "When we saw the extreme cold was on the way, we got proactive and we started making space knowing it would be filled." Just about every space is filled. There are opossums, bats, hawks and ducks. 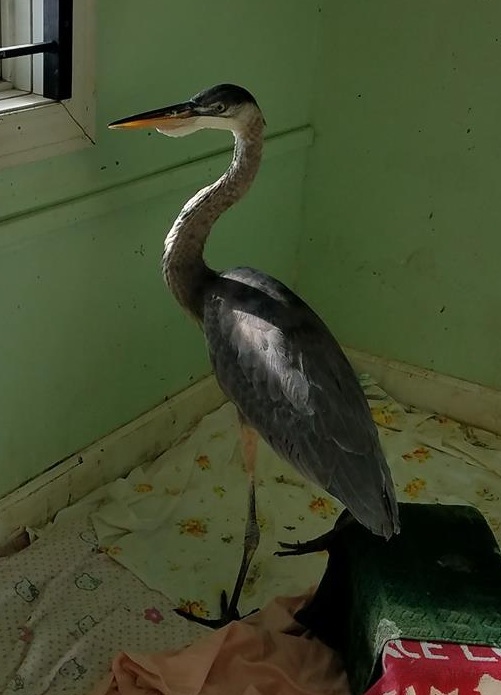 There's even a Great Blue Heron in the closet, and another one in a bathroom. Laura says some of you may be surprised to learn there are Great Blue Herons in the area this time of year, but it's not unusual, "As long as there is shallow water they can fish in, they stay all year long. They can handle the cold they just need to be able to fish. When the water freezes up and they struggle to fish, they can become debilitated and hypothermic because of the cold." The animals are here because someone stepped in to help. Laura says if you see an animal that looks like it may need to be brought to the center make a call, "Sometimes an animal is doing exactly what it should and there is no reason for us to get involved. However, when it's this cold outside we would rather err on the side of caution and go check it out." The goal is to return as many of the animals as possible to the wild. There are a number of permanent residents that are used for education, and they all had to be moved around this week because of the weather too. Nature's Nursery took in more than 2,800 animals last year. It's an around-the-clock job taking care of each and every one of them. Steve says and volunteers are a critical part of the operation, "Whether it's 100 degrees or ten below zero they are here 365 days a year and we are appreciative of that for sure.We are very lucky to have such a wonderful staff and volunteers." Nature's Nursery relies on donations to keep the doors open. The center is always in need of supplies,volunteers and money. There's an amazon wish list too.